Smart business owners find customers by placing their marketing messages where the most eyeballs are focused. And nowhere are there more eyeballs than on the screens of mobile devices such as smartphones and tablets. More than two thirds of the world’s population has a mobile subscription, and mobile users are highly active. Facebook recently reported statistics indicating that over half of its 500 million subscribers access Facebook from a mobile device and exhibit twice the activity level of non-mobile users. The time for mobile marketing is now. Pull customers to your SMS messages by asking people to opt-in to your text-messaging list. Use a text-messaging provider such as eztexting.com or motomessage.com to access a short phone number known as a common short code and an opt-in keyword. Then, use the text-messaging service to push periodic text messages out to the people who opt in. MMS messages are like SMS messages, but they can contain pictures, sound and a lot more text. Pull customers in with the same opt-in process as SMS, and then push out multi-media content via your MMS service provider. Pull customers to your email list with signup links on your website or ask people to text in their email addresses to join. When you push your emails out to mobile users, ask for mobile-friendly actions such as clicking phone numbers instead of links or using the mobile device to show an email coupon at the point of sale. People searching online with mobile devices are often looking for a nearby product or service. Pull customers to your business by including mobile-friendly maps and directions on your site. Push your location out to new potential customers by asking your customers to check in on their favorite social media service when they visit your physical location so their friends see where they are. Pull mobile visitors to your site by advertising your site's address or by including a mobile barcode -- also known as a Quick Response or QR code -- in your advertising that points to your site. Push messages through your site by formatting content and navigation to be mobile friendly. Pull customers to your mobile apps by listing your apps in the app stores and by offering app downloads from your own mobile site. Then, push your marketing messages through the downloaded apps. Pull customers to content such as videos, images and downloads by providing links and mobile barcodes that activate the content. Push that content by posting to mobile-friendly sites such as YouTube or your own mobile site. Pull customers to your advertising by placing ads on external mobile sites such as mobile versions of newspapers, blogs and other content sites. Push your advertising out by including ads in your e-mails, text messages, mobile content and branded apps. Pull customers in by advertising your phone number. Push your messages out by answering the phone or by using Interactive Voice Response systems to answer calls and deliver voice messages automatically. Mobile devices come with built-in capabilities and enablers such as cameras, WiFi, and GPS. Pull customers in by asking customers to use their capabilities. For example, taking a picture of a product and e-mailing it to you for a discount. Push your messages out in reply to people who use their capabilities by using one of the aforementioned nine channels. 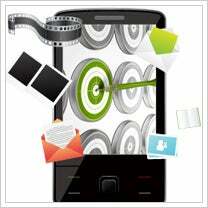 Have you attempted a mobile marketing campaign? Let us know how it worked for you in the comments section. - John Arnold is president of Aveta Marketing, a marketing agency in Boulder, Colo.